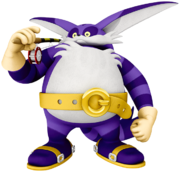 Big the Cat, often shortened simply to Big, is a large purple cat who appears in the Sonic the Hedgehog series. Big the Cat first appeared in the Mario series in the Wii version of Mario & Sonic at the Olympic Games, where he appears as a referee in the Athletics and Rowing events. Big can also be seen behind the podium in the Athletics events during the awards ceremony. Big the Cat also appeared in both the Wii and Nintendo DS version of Mario & Sonic at the Olympic Winter Games. In the Wii version, Big the Cat appears as a VIP Member, and along with Birdo is the only character to give the player a costume as well as 100 Star Points. An unlockable costume for Mii characters of Big also appears in the game. In the DS version of the game, Big appears as one of the characters hosting a mission. He is found in Polastraits, wondering what is the "sign" near him. Amy Rose tries to explain that each mission's details is written there. However, Big still doesn't understand and Amy had to try out the mission and complete it to make him understand. When she does, he rewards the player with a Spark Luge. The mission Amy has to take is Alpine Skiing GS. Big the Cat makes a cameo appearance in the Wii version of Mario & Sonic at the London 2012 Olympic Games as an unlockable Mii costume. 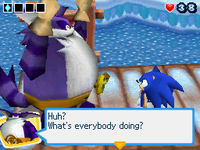 Big the Cat also appears in the Story mode of the Nintendo 3DS version. Big the Cat appears in the Wii U version of Mario & Sonic at the Rio 2016 Olympic Games, where he appears as an unlockable Mii costume. In this game, players can access the Pousada after talking to Big on Copacabana beach. Although Big never makes a physical appearance in Super Smash Bros. Brawl, he makes a cameo appearance as a sticker. Big the Cat also makes a cameo appearance as a trophy in Super Smash Bros. for Nintendo 3DS. Big the Cat makes an appearance as a novice spirit in Super Smash Bros. Ultimate. Big the Cat Big the Cat spends most of his days in peace with his best friend, Froggy. But he's no ordinary cat! He enjoys napping, eating, more napping...um... He also likes fishing, which tests his strength. And if Froggy is ever in danger, Big won't even think twice before helping! This page was last edited on March 29, 2019, at 01:26.